A beautiful combination of form and function. 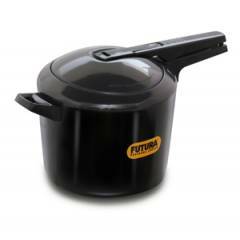 Futura cooks on average 46 Percent faster than a microwave oven.. Absorb heat faster And energy efficient. Stays looking new for years.. The unique pressure regulating system gives you the convenience of finger tip pressure release and prevents clogging of the steam vent. The double thick base stays flat, heats evenly and is ideal for light frying before pressure cooking..